The following information was obtained from the attached Fairchild data sheet. The NDT3055L is a logic level N-Channel enhancement mode power field effect transistor.The high cell density DMOS technology minimizes on-state resistance and provides excellent switching performance. The device also withstands high energy pulse in the avalanche and commutation modes. For use in low voltage applications such as DC motor control and DC/DC conversion where fast switching, low in-line power loss, and resistance to transients are needed. Breakdown Voltage Temp. Coefficient: 55mV/�C typ. Zero Gate Voltage Drain Current: 1.0uA max. Gate - Body Leakage, Forward: 100nA max. Gate Threshold Voltage: 1.6V typ. Gate Threshold Voltage Temp. Coefficient: -4.0mV/�C typ. Static Drain-Source On-Resistance: 0.07Ω typ. On-State Drain Current: 10A min. Forward Transconductance: 7 sec. typ. Reverse Transfer Capacitance: 30pF typ. 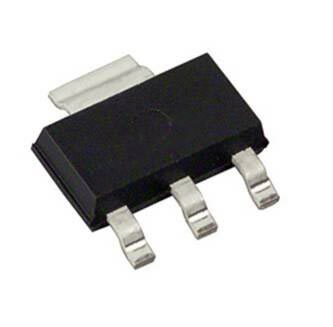 Maximum Continuous Drain-Source Diode Forward Current: 2.5A max. Drain-Source Diode Forward Voltage: 0.8V typ.